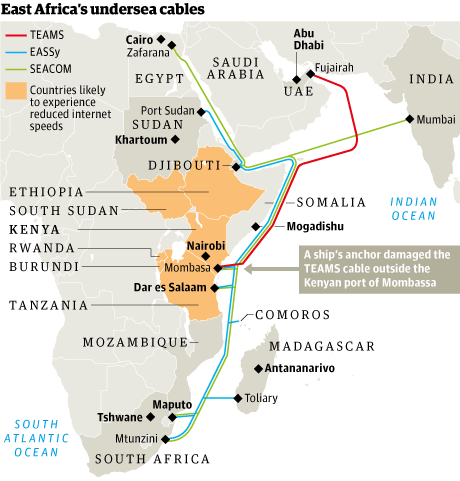 Safaricom now owns a 32.5% stake in the TEAMs (The East Africa Marine System) fibre cable. The telecomm operator increased its shareholding in the undersea cable after Essar offered to sell their 10% stake in TEAMs. As a result of this deal, Safaricom is now guaranteed additional capacity in Teams based on its shareholding. Current shareholders on the TEAMs cable are the Kenya government at 20%, Telkom Kenya at 20%, Kenya Data Networks – 10% and Jamii Telecom – 6.25%. Essar has been facing a liquidity crisis and this deal promises a much needed cash injection. The company acquired bandwidth on the undersea TEAMs cable back in 2008. The bandwidth however not been put to operation by Yu after the telecomm company failed to close most of its financing deals. “The additional shareholding in Teams entitles Safaricom to have increased capacity on the 1.28 TB/s international cable. It is an integral part of our data strategy to have sufficient international capacity to feed the demands of our growing customer base and to support our terrestrial fibre strategy and LTE plans.” – Safaricom. Safaricom is currently laying an inland fibre cable networks that is expected to span 2,300Km at a cost of Kshs 8 billion. The mobile provider currently accounts for 80.2% of Kenya’s mobile phone voice market and the number of its data users stands at 9.33 million data users as of June this year. CCK (Communications Commission of Kenya) has however labelled the mobile operator as non-compliant on quality of service over a significant number of dropped calls and fluctuating data speeds. As the demand for data services increases, the telecomm provider has even offered free setup services for businesses who will connect to Safaricom’s fibre cable. Plans are also underway to offer TV content to its customers as the company is now moving from reliance on other internet providers’ backbones.